While it’s the most effective way to achieve a perfect surface, sanding is also the most challenging to manage. There’s the debris, of course, which includes a lot more fines than other operations such as planing, routing or shaping. And then there’s the disposable nature of the abrasives, which can wear or clog a lot faster than a carbide edge will dull. So making purchasing decisions isn’t only about the machine. But it does start there. 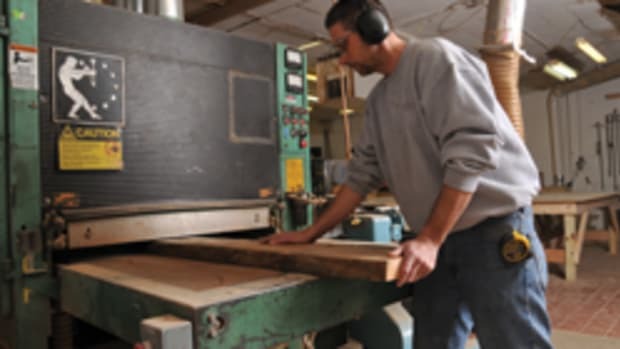 One of the most iconic names in woodshop equipment, Timesavers (timesaversinc.com) has built sanding machinery for more than 70 years. The Minnesota-based company’s panel sanders are its most robust offerings. The 3300 Series is a customizable machine that can be outfitted with up to four heads, while the 5300 Series is an immensely heavy and powerful machine that can be outfitted with up to five heads and is suited to the largest and most demanding panel-sanding projects. For small- and medium-sized cabinet and furniture shops, a popular option is the SpeedSander, which uses a combination drum and platen head to process small-to-medium-sized woodworking projects. For larger jobs, there’s the 2300 Series that comes with either a 75” or 103” abrasive belt and can be configured with up to four heads. Timesavers also builds task-specific machines for orbital, veneer and lacquer sanding, plus brush sanders and heavy stock removal machines. Felder Group USA (feldergroupusa.com) is an Austrian manufacturer with U.S. headquarters in New Castle, Del. The company recently added two new machines to its stable of seven wide-belt sanders. Both the Finish 1352 and 1353 models offer an option for touch-screen control and can be set up as either a two- or three-belt arrangement. The model name comes from the 1350mm processing width and an optional carbide insert planer head can be added on the machines’ infeed sides. These Finish models have an electro-pneumatic sanding pad that is lowered onto the work at both front and rear with precise tolerance and the controls are designed to prevent veneered surfaces from being sanded through. A vacuum table, brushes and roller extensions are all offered as options. 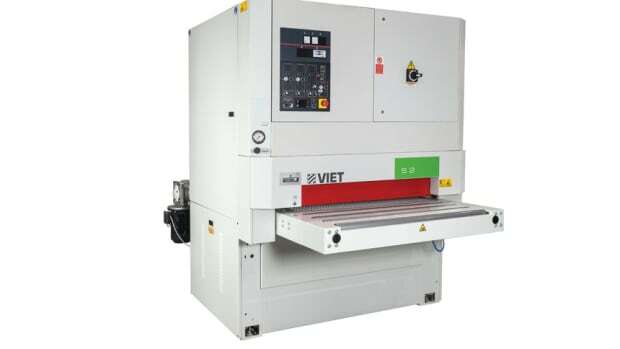 Biesse America (biesse.com/na) currently offers a range of nine Viet brand wide-belt sanders. With headquarters in Italy, it has offices in Anaheim, Calif., and Charlotte, N.C. The company is very accessible: it operates 200,000 sq. ft. of showrooms and every year conducts 7,000 demos worldwide. One of its latest support innovations is Parts, a 24/7 online system where shops will be able to locate and order spare parts. 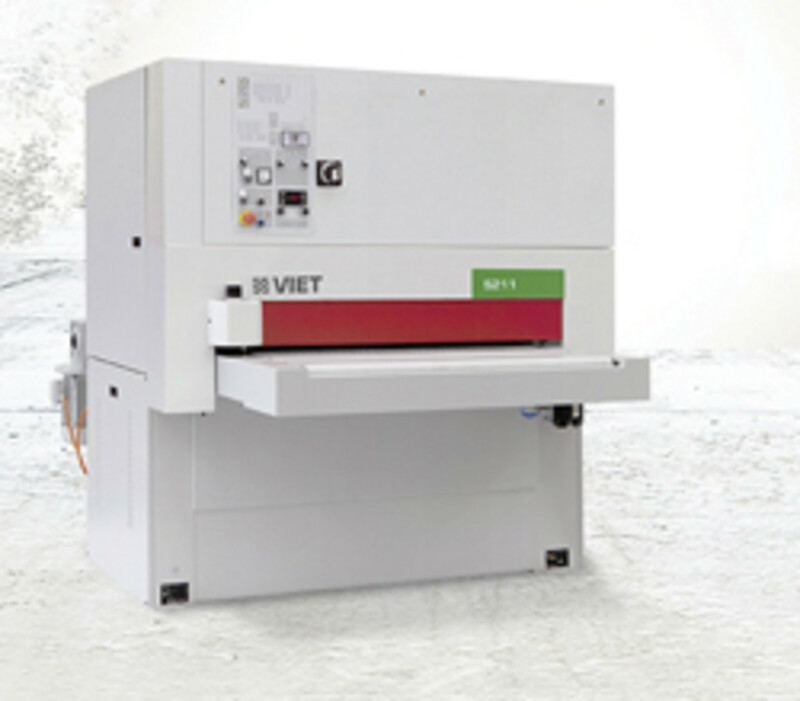 With green goals in mind, Biesse’s Viet range of machines includes the ESS system, which allows for energy savings of up to 30 percent and that affects both electricity consumption and CO2 emissions. The entry-level S211 is ideal for smaller, artisan workshops and the machines increase in power and ability from there. Eurowood Machinery (eurowoodmachinery.com) is an importer and supplier of machinery and replacement parts. Its Italian brand Stemas (stemas.it/en) offers more than two dozen sanding machines, most of which are designed for very specific tasks. They run the gamut from quite small to very large and will sand and glaze moldings and profiled panel edges. 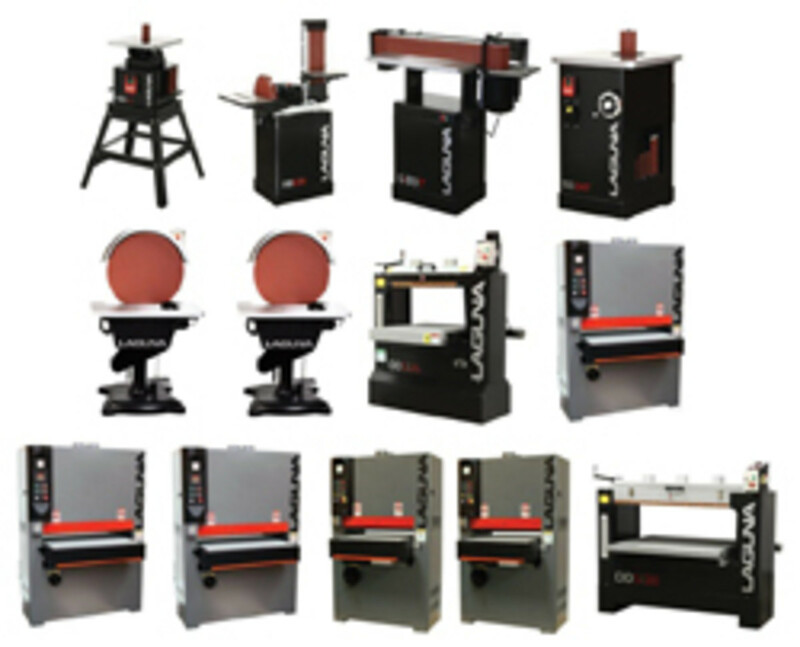 Global Sales Group (globalsalesgroupllc.com) offers a variety of Castaly brand — formerly Lobo — sanding machines that tackle curves and rounds, lacquer and orbital finishing and also wide-belt tasks. 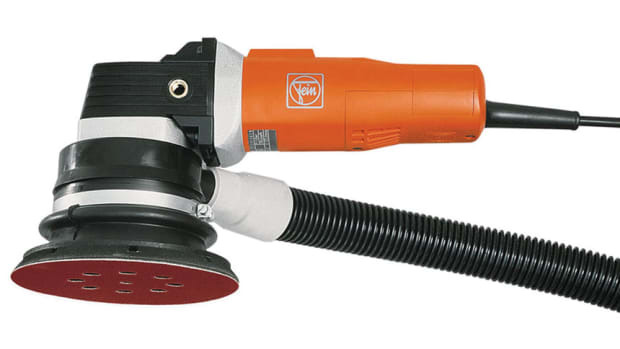 One of the more unique is the RC-420V round pole sander that will even work on tapered pool sticks in full automation. The company also carries Safety Speed and Dotul wide belt sanders. Martin Woodworking Machines (martin-usa.com) is a subsidiary of a German manufacturer that has been building machinery since 1922. The line consists of six Weber brand wide-belt sanders and the entry-level model is the LCS that has Weber’s patented ISA segmented platen system within the framework of either a single- or double-belt version. The single is equipped with a combined station, while the double-belt machine has a contact roller station as well as a combined station. Calibrating and finish sanding can be performed individually or in combination. Working widths are 43” and 51”. 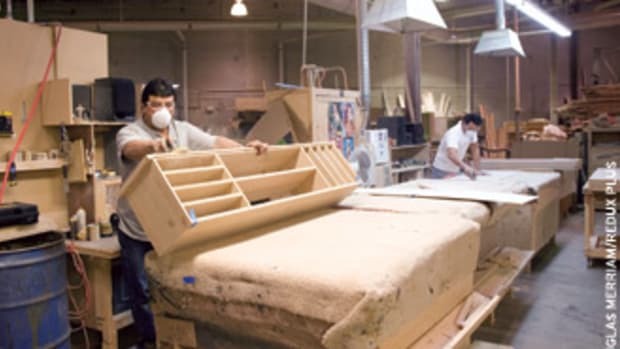 Chicago-based Opti-Sand (opti-sand.com) has a comprehensive line of machines including molding sanders that work on trim, flooring, paneling, siding and other linear parts. They’re modular, so a woodshop can add top, bottom or side spindle modules as needed. The company’s rotary sanders work on cabinet doors, drawer fronts, face frames, entry doors, shutters and other three-dimensional parts. They come standard with a vacuum conveyor belt and are available with power-adjustable twin belts with edge sanders. Opti-Sand also offers panel sanders, hanging door line sanders (for entry/passage doors), and wire brush options for texturing or distressing panels, siding, flooring and frames. 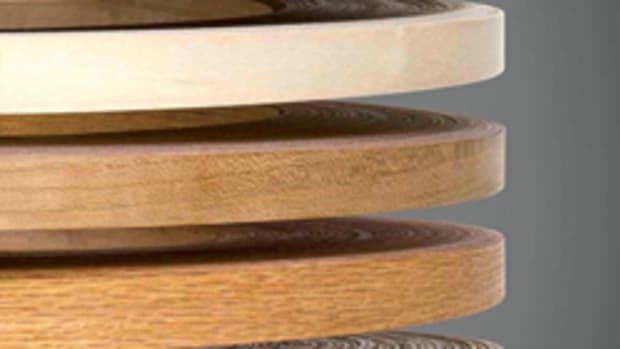 Voorwood (voorwood.com) offers half a dozen feed-through shape-sand machines, a range of table shape-sanders and its Turbosand line of rotary sanders. These latter sand the profiled edges of doors and panels or reach into grooves and decorative features. Most of the profiles in the catalog can be downloaded as DXF files. 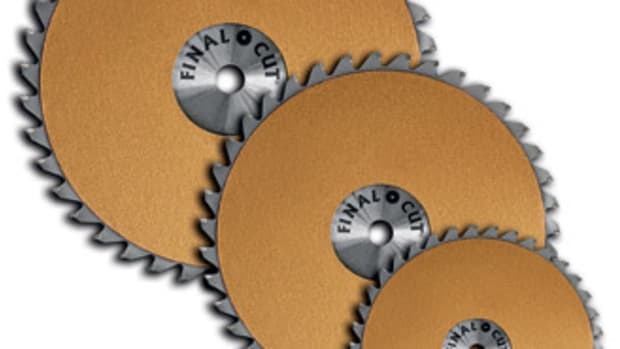 And Voorwood also offers TurboflexPro flap-sanders, which are die-cut to better match a profile without sanding off outside corners or skipping over inside curves. Apex Machine Group (apexmachinegroup.com) offers three families of sanding machines. The 1000 series comes in widths from 13? to 43?, in single- to three-head configurations with drum, brush, disc or combination heads. The 2000 Series runs from 13? to 52? wide and has up to four head options including a cutterhead. And the heaviest duty 3000 Series sands from 25? to 64?, also with one to four optional heads. Costa Sanders LLC is part of a global corporation with U.S. headquarters in Archdale, N.C. The company’s machines are available in widths from 350mm (13.77”) through 3200mm (126”) and are customizable to process the bottom, top, or both surfaces in one pass. They range from the SK Series (which has a vacuum plant for processing small parts and built-in roller table extensions) through five families to the S Series. 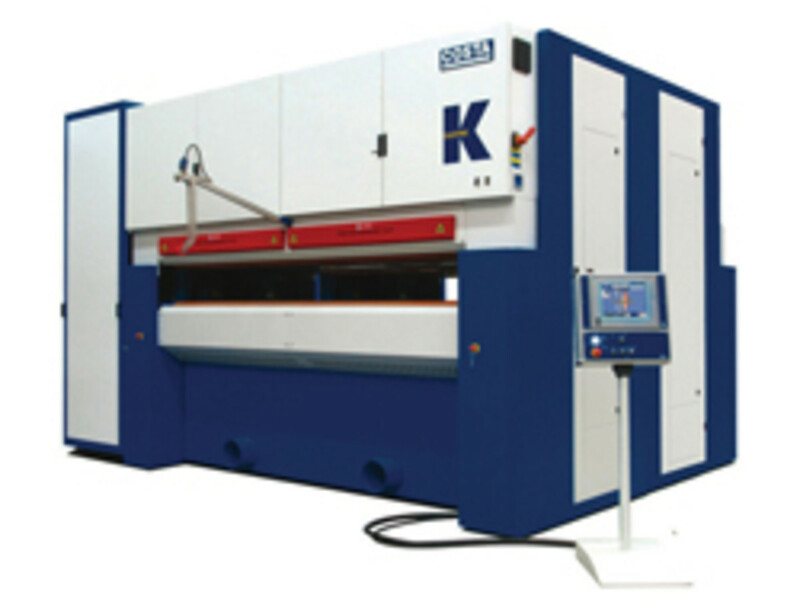 Here, the frame, abrasive sizes and power can all be tailored to any production level, as well as to aggregate traditionally different processes into one single machine body. With its different frame types and lengths, the line can accommodate from one to 10 working units. Roba brand surface, profile/molding, distressing and edge sanding machines are the products of MB-Maschinenbau GmbH (mb-maschinenbau.de), located in Herford, Germany. The patented Roba Tech, the introductory machine, is equipped with a new sanding belt that contains 174 strips. An area of about 50” square contacts the workpiece and 360-degree rotation of the sanding aggregate over the work makes it possible to reach all edges and corners. 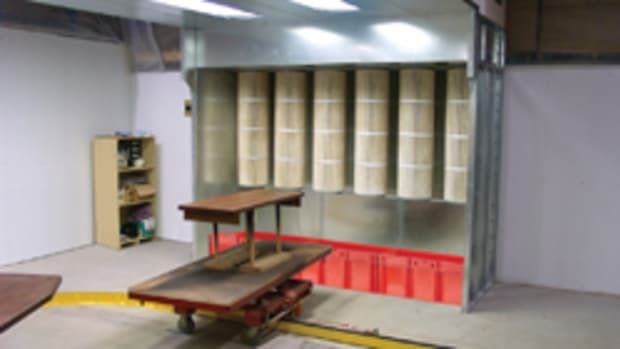 The large sanding area lets the machine achieve its best cutting results at low rotation speeds and this allows the sanding strips to slide gently into milled grooves and sand them properly. For moldings, the Roba SSM is specifically designed for MDF and intermediate lacquer sanding, using abrasive wheels. Familiar to woodshops because of its CNC routers, edgebanders and panel saws, NexTech Machinery has just moved into a beautiful new tree-lined facility in Cornelius, N.C. where several machines are installed and set up to demo and do sample runs. The company (nextechmachinery.com) offers a family of four wide belt sanders for small to medium sized woodshops. 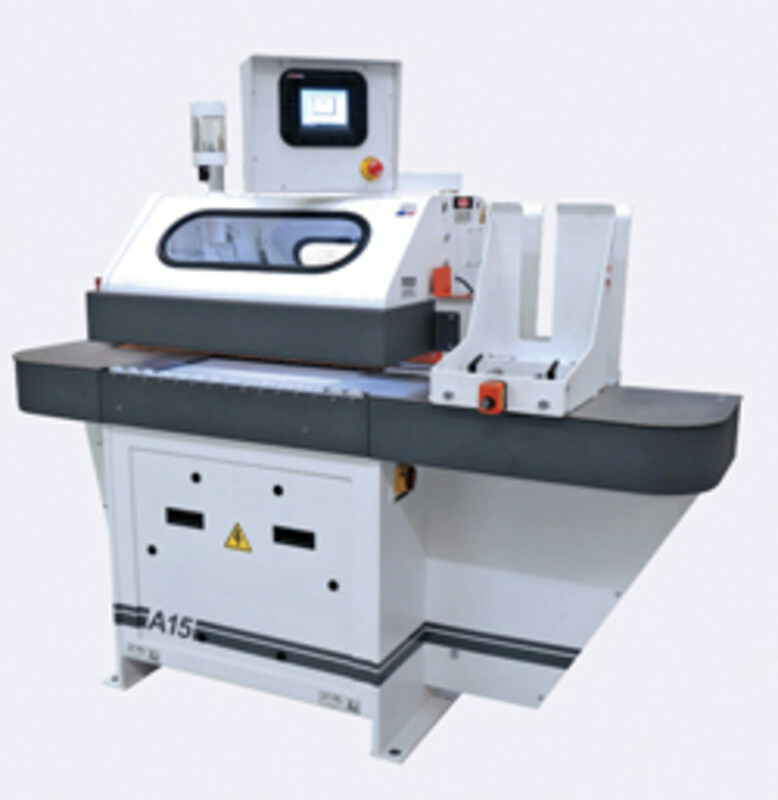 The single-head S37-C is the entry-level sanding machine and it has a width capacity of 37.4”. Next in line in terms of size, the S43-RC has two sanding heads that handle workpieces up to 39? wide and then the S52-RRC reaches to 51? wide. At the top of the ladder, the PS52-PRC offers all the features of the S52-RRC with the added advantage of a 40-hp steel helical planer head. This planer/sander handles workpieces that are up to 51? wide. The catalog of Oliver Machinery (olivermachinery.net) includes five wide-belt sanders with 25” to 43” capacities, a 37” dual oscillating drum sander, two edge machines and a spindle unit. The drum sander (model 5555) features more than a half-inch of oscillating travel, quick-change sandpaper and an independently adjustable rear drum. It has a 15-hp motor, cast-iron base, four-post table construction, twin 4” dust ports and an amp meter. Laguna Tools (lagunatools.com) offers a complete range of small- and medium-sized machines. 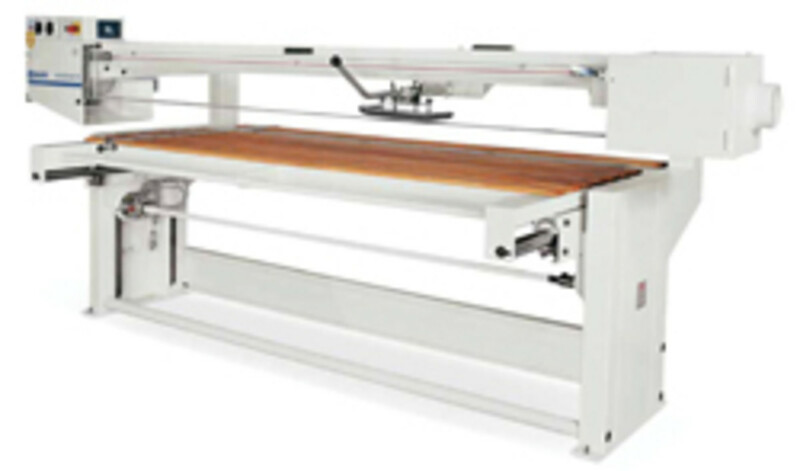 Included are several models of spindle, belt and disc sanders that accommodate the needs of a range of woodworkers from hobbyist to small shop pros, or designated tasks in larger environments. Laguna’s DDS 26 is a double-drum head that handles work up to 26” wide, and the DDS 38 model extends that capability to 38”. The company’s family of wide-belt sanders caters to work from 25” to 51” and the top of the line Pro 51 is equipped with a primary 8” roller and a secondary 4” roller followed by a wide platen for fine finish. This allows a shop to dimension and finish in one pass. 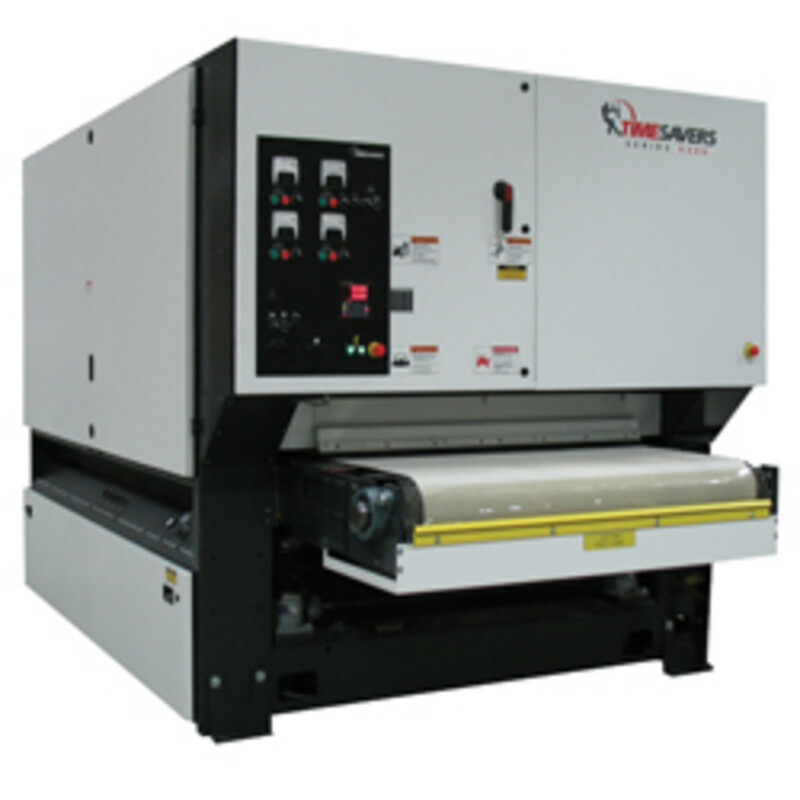 Cantek America (cantekamerica.com) has 6”, 9” and 12” wide-edge sanders, a three-sided molding sander, combination planer/wide belt units ranging from 24” to 51” with insert knives, plus two single-head and a double-head small wide belt. Cantek’s PR series wide-belt machines are available with one to four heads and in widths from 24” to 51”. The sanding heads available include a 10” contact drum (rubber or steel), and a combination head with a 5-1/2” diameter drum and 2-5/8” adjustable sanding platen. Doucet Machineries (doucetinc.com) offers a number of edge belt sanders including models with two belts that allow the operator to run different grits simultaneously. The Doucet Progress model P-12-60 is an extremely versatile combination machine that includes a 12” disc and a 6” x 60” belt sander. Newman Machine Co. (newmanwhitney.com) manufactures the A-4000 and PST-4000. The former is a four-stage wide belt sander and the latter adds a helical carbide planer cutterhead and comes in 12 different configurations and up to four heads. Both machines have quite sophisticated control panels, and the range is from 38” to 54” in width. 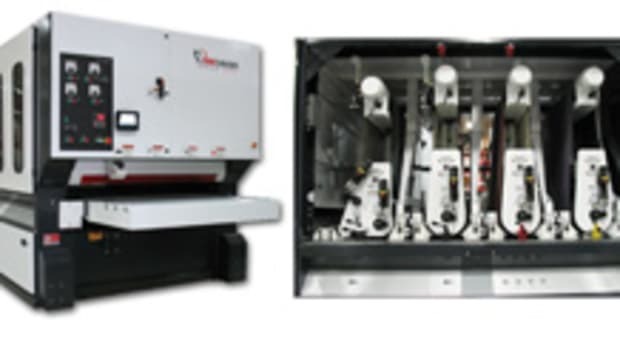 SCM Group NA (scmgroup.com) supplies a range of 13 machines under the DCM brand and three Minimax models. The wide-belt sanders range from the entry-level DMC SD 10 with a 37.4” wide capacity to the 64.9” DMC System TT 1650 and beyond. The Minimax Is is a surface belt sander with a double gooseneck and two exhaust hoods and the Minimax U 150 is a standard 6” edge sander with a worktable that can tilt to 45 degrees and an additional table with rubber rollers for shaped workpiece sanding that can be quickly installed and removed. Attendees at major woodworking shows are familiar with the impressive presence of Stiles Machinery Inc. (stilesmachinery.com) at most venues. Stiles offers a comprehensive range of sanding machines from wide belt and edge units to brush, robotic, profile, orbital and calibration sanding. The lines include Kuper, Heesemann and Makor brand machines, and there’s a Heesemann wide belt sander for almost any size application. For example, the KSA-8 is available with one to six heads (top and bottom), is designed for sanding lacquer, veneer, or veneer and solid wood, and is available in 62”, 70”, 78”, and 86” widths. One major advantage to dealing with Stiles is that the company maintains a network of five regional service centers and a nationwide force of more than 100 field service representatives. When it comes to smaller machines, the range of options increases quite a bit. SuperMax Tools (supermaxtools.com) offers a family of drum and brush sanders that handle work from panels to profiles, and sometimes both. For example, the company’s 19-38 combo machine has interchangeable drum and brush heads. The nylon brush is ideal for pulling the grain out of soft woods, or cleaning up reclaimed lumber. Safety Speed (safetyspeed.com) offers a pair of wide-belt sanders that were designed to be affordable for smaller shops. The 3760 model comes in 10- or 15-hp configurations and handles sheets up to 36” wide, while the larger 4375 has a 42” maximum working width. Baileigh Industrial (baileigh.com) offers three drum sanders, two oscillating spindle sanders and four options on edge/belt sanders — all under $3,600. Woodmaster (woodmasterdrumsanders.com) also offers economical, but high-quality solutions for smaller shops with three single drum options and two doubles. Grizzly Industrial (grizzly.com) has a wide array of choices that bridge the gap between one-man operations and production shops. 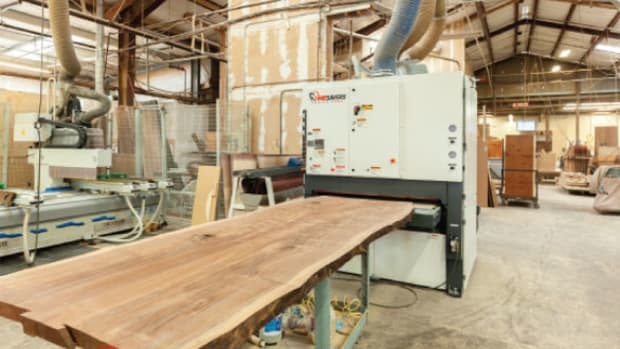 The top of the line is a 51” wide belt sander at $23,450 and the offerings work down through several intermediate models to a 15” open-sided wide belt sander that retails for $4,695. After that, Grizzly has families of drum and edge units, and a rich offering of disc, belt, flap and spindle solutions. Woodstock International (selling the Shop Fox brand and found online at woodstockint.com) offers options similar to the Grizzly line. Larick Machinery (larickmachinery.com) carries a half-dozen small-profile sanding machines and a couple of shaper sanders. Quickwood (quickwood.com) makes molding sanders with four heads for sanding moldings on three sides. And Maksiwa (maksiwa.com) has a benchtop disc sander and a floor model disc/belt combo. The Sand-Flee (rjrstudios.com) is an 18” wide portable drum sander than can be used on a bench or even taken to the job site. It’s ideal for flat sanding small parts. And the DB-612-DLX is a benchtop all-purpose contour and finish sanding machine from Sand-Rite (sand-rite.com) that has a pneumatic drum and a brush for cleaning up small parts and profiles. Watch your mailbox in October for a Woodshop News supplement on finishing that, in addition to covering coatings, will also have more information on both sanding and dust control. It runs the gamut from a hands-on, one-cabinet-door-at-a-time benchtop activity to a fully automated industrial process where machines do all the work.